Appearing on Fox News Sunday morning, Donald Trump appeared a little sore after the ribbing he took at the White House Correspondents' Dinner. "I didn't know I would be virtually the sole focus, but I guess when you are leading in most of the polls, that tends to happen," Trump said, about the verbal lambasting he suffered at the hands of President Obama and host Seth Meyers. Speaking about the man he may run against for president, Trump was measured. "It is inappropriate in certain respects, but I thought [Obama's] delivery was good." But he had little charity for Saturday Night Live's Seth Meyers. "I thought Seth Meyers, frankly, his delivery was not good. He's a stutterer and was really having a hard time," Trump said. 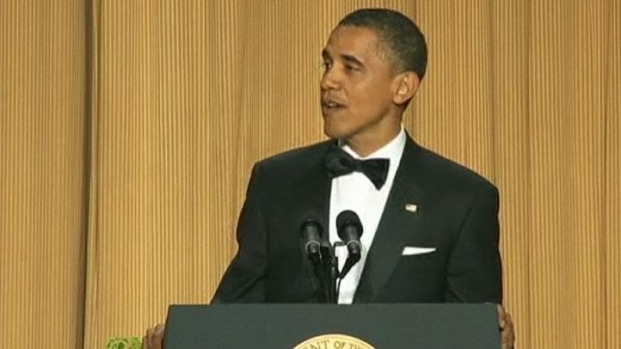 President Obama cracked up the crowd at the Washington Hilton on Saturday night, there for the White House Correspondents' Dinner. SNL's Seth Meyers hosted. Meyers was pretty clear when delivered a number of quips about Trump, including this one about his hair: "Donald Trump often appears on Fox, which is ironic because a fox often appears on Donald Trump's head. If you're at the Washigton Post table with Trump and you can't finish your entree, don't worry, the fox will eat it." In the crowd of journalists, businessmen, actors, and other VIPs who came to the Washington Hilton on Saturday for the White House Correpondents' Dinner, nobody was safe on Saturday night. The President came out to a montage of American icons, including the bald eagle, Transformers and rock and roll, all put to the song "I am a Real American" by Rick Derringer. The president dished out a bit of self-deprecation, but then heaped zingers on his political foes around the room. President Obama gave some tongue-in-cheek praise to Donald Trump for being able to make tough management decisions on his television show "the Apprentice." The President also suggested that Trump investigate other conspiracy theories, like UFO sightings in Roswell or the faked moon landing. Turning to another possible Republican challenger for president, Obama joked that Repubican congresswoman Michele Bachman was from Canada. "Yes, Michele, this is how it starts," the president said. Seth Meyers also piled on Trump. "He says he's running as a Republican, which is surprising, since I just assumed he was running as a joke." Meyers had fun with Trump's speaking style. "I like that Trump is filthy rich but nobody told his accent," Meyers said. "His whole life is models and and gold leaf and marble columns, but he still sounds like a know it all down at the O.T.B." Click on the video above to hear more zingers from President Obama and Seth Meyers.